Our school breakfast and lunch program is shared with the Fayston School. The program provideS delicious, healthy meals that often use local ingredients. Students have a variety of choices, such as a salad bar full of a variety fresh, raw vegetables served with every meal. Additionally the program features all local, organic beef along with other local products as available. Both Fayston and Waitsfield have school gardens through which students grow produce featured in the lunch and breakfast program. Vegeterian options are available daily. Special food requests should be directed to food service director Cheryl Joslin. Hot lunches cost $3.25 per day and breakfast is $1.75. Students bringing bag lunches may purchase milk for $.35. Please pay by check and place the check in an envelope with the child’s name on it. It will be easier for both you and the food service liaison person to keep track of payments if you follow these guidelines. Credit is not available. Applications for federal aid are available from the school or on the school website. 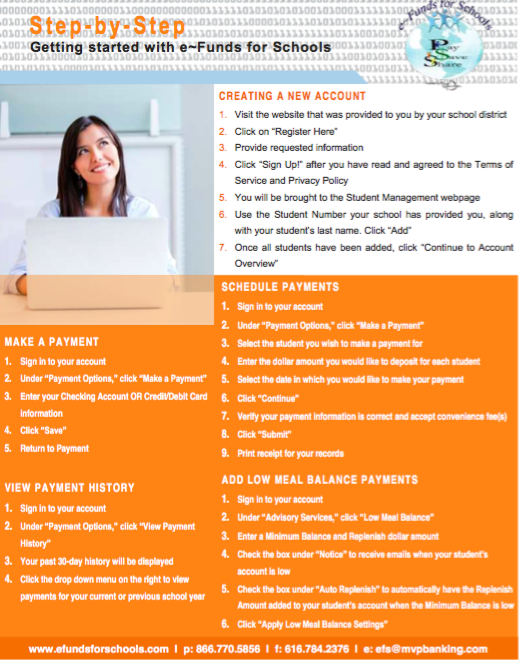 You can make payments to your child’s school lunch program balance online, paying with a credit card or direct withdrawal from your checking account. To do so, create an account using the “e-Funds for Schools” system. Directions can be found below.